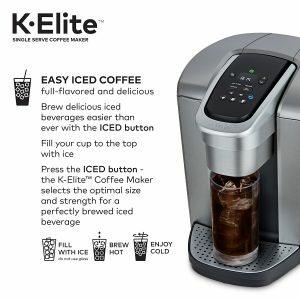 Keurig K-Elite is the latest Keurig coffee brewer with a 12-ounce size, that makes a single serve of coffee with K-cup pods. It is a programmable unit with a proper temperature control and is capable of making iced coffee with the iced setting. The K-Elite looks sleek and modern, has a premium finish and the real metal details and is offered as brushed silver or brushed slate with the latter being 27 dollars more expensive at the time of this review. It is one of the most popular single-serve coffee makers on Amazon.com at the moment and scores 4.2/5 stars out of 58 customer reviews. In the box, you will get a water filter handle and a filter for better tasting coffee as most of the coffee is water and a 6-count K-cup pods of different types. This is a single serve coffee brewer that allows beverage customization and can make 4, 6, 8, 10, and 12 ounces of cups. It brews coffee very quickly in less than a minute with the strong brew button you can get a stronger coffee with more flavour and bolder taste. You can also brew beautifully flavoured and very tasty iced coffee with a single touch of a button. If you want just hot water without coffee you can get it straight away by pressing the hot water button for your porridge or instant noodles or soups. You can make approximately 8 cups of coffee, tea, hot cocoa or iced beverage before you need to refill the big removable water tank. This will save you on time and effort and will make it a little bit easier for you in the mornings. There is also a full drip tray that makes the cleaning easier and that you can detach easily. And you can fit in travel mugs that are up to 7.2 inches tall. You can either use one of the many K-cup pods or purchase the universal “My K-Cup” reusable filter for your own freshly ground coffee. You can not use the other types of reusable filters on this coffee machine as the My K-Cup is the only approved accessory. The Keurig K-Elite weighs 6.6 pounds and measures 10.5 x 7.5 x 11.1 inches. 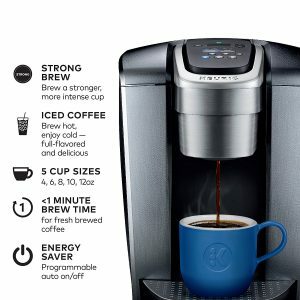 You can use all kinds of K-cups including the generic non-branded ones with this unit as there is no optical detector that allows only the use of Keurig K-cups. It is nice to have different buttons for different cup sizes and the iced, strong and hot water. The Keurig K-Elite and K-Elite C are the same model coffee brewers with only the difference in the accessories you will get in the box. You can’t use the larger pods with this model and not make more than a single cup at a time and has a smaller water reservoir than the K575 model. You can adjust the temperature setting to brew the coffee between 187 and 192 degrees for how hot you want your coffee or other beverages. It is very easy to operate with an easier control panel and you will get it set to192 degrees straight out of the box. You’ll probably find that it is much easier to press a couple of buttons than scrolling through a digital display like on some Keurig machines and definitely brews coffee faster. It is well worth the money.